Whatever they’re called—appetizers, tapas, small plates or starters—this menu category is a hotbed of growth and creativity. With mix-and-match dining on the rise, according to Chicago-based research firm Technomic, an appetizer can be a snack, and a trio of small plates can make a meal. Lightening up. 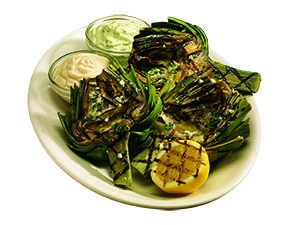 A new Steakhouse Starter at the Los Altos, Calif.-based Black Angus is the Fire-Grilled Fresh Artichoke ($9.99) with lemon aioli and basil-pesto mayo. David Bolosan, director of product innovation for the 45-unit chain, created it “as a healthier alternative and to take pressure off the deep-fry station,” he says. The appetizer fits in with the fire-grilling part of the brand, Bolosan says. It’s now one of the top three sellers. “I’m trying to get customers on-trend with more grilled items and cleaner, more interesting flavors. Fried appetizers are very one-dimensional,” says Bolosan. Many of the healthier starters also show up on Black Angus’ BullsEye Bar menu, available at select locations. The chain found that sharing is such a widespread activity that it renamed its BullsEye Beginnings menu section as BullsEye Shareables. “More people are making a meal of appetizers at the bar,” says Bolosan. Global inspiration. In a Technomic survey, about 40 percent of consumers report that unique or ethnic flavors play a strong role in their appetizer decisions. At Bulla, a Spanish gastrobar in Coral Cables, Fla., Executive Chef Luis Quant updates his global menu with modern touches. The tapas section dominates, attracting diners who appreciate sharing. Added up and accompanied by Bulla Gastrobar’s signature sangria, the check can average $35, says Quant, without a “larger plate” in the order. Quant’s goal in creating his tapas was to use ingredients across the menu. Although some of these small plates are labor intensive, cross-utilization helps control costs, he says. Serrano ham, for example, is used in lunch sandwiches and a chicken entree at dinner as well as in popular tapas such as Croquettas de Jamon and Huevos Bulla. The latter is based on homemade potato chips and ham, enriched with potato foam and truffle oil and topped with a fried egg. “It’s a concussion for the soul,” says Quant of the dish. And the potato foam does double duty; it’s one of the modern touches Quant adds to a short rib large plate.